It used to be the case that you could ride your bike and that would be that. Now, we can measure every possible aspect of our rides – speed, distance, cadence, heart rate, power output, elevation, calories burned – and can make it all publicly viewable on the internet. It’s an extrovert cyclist’s dream. Like anything else, putting things on public view inevitably means that it will be scrutinised by other people: there’s not much point in uploading your cycling data for all to see if you don’t want anyone to look at it. Ride logging and comparison website Strava is currently the most popular way for cyclists to share their rides online. We’ll admit that there is some satisfaction in uploading what you consider to have been a good ride to see your friends give you the kudos thumbs up. A job well done with an electronic back slap. However, it has come to our attention that there are some people who manipulate their rides to polish them up a bit. To make them look a bit better than they really are. And in some cases, a lot better than they really are. This article is dedicated to everyone who has their cherished Strava KOM stolen by someone doing 40mph up a hill, or whose Strava friends are mysteriously posting rides several miles an hour quicker than you reasonably think they are capable of. Let’s out the cheats. Disclaimer: We absolutely do not condone the use of any of these nefarious activities to falsely inflate your riding prowess. Have you ever fallen victim to a Strava cheat? Or cheated yourself? Let us know. One surefire way of looking fast on a Strava ride – at least until someone clicks on the route profile – is to start at the top of a big hill, ride down it, ride around a bit, and then conveniently stop the GPS computer before going back up the hill again. The rider can then have all the benefit of the 30mph cruise downhill, and none of the average-speed-reducing drawback of the 8mph trawl back up it. When questioned on the odd nature of the ride, the offender will likely offer up an excuse along the lines of “Oh yes, I stopped off there at a friend’s house at the bottom of the last hill and forgot to turn the GPS back on”. The close cousin of number one is chopping ‘slow’ bits off the start and finish of your ride. Some people leave off the first mile or two of their ride to give themselves time to warm up before their ‘proper’ effort starts – the one that will be made public. Some people will claim that this isn’t cheating at all, but it’s hardly in the spirit of logging your riding. We want warts and all, good days and bad days, slow bits and fast bits. Let’s see every mile. We’re not really sure of the mindset of whoever it is behind the Digital EPO website. You can upload your GPS file and simply select how many percent quicker you’d like to have ridden. Then you click a button marked ‘juice my ride’ and it outputs a new file which you can upload to Strava. The website itself is unrepentant on its facilitation of cheating: “Start raking in the KOM/QOMs,” it says. “You deserve ’em. You made an important contribution to safety by keeping your racing off the street”. Trouble is, the manipulated files often contain spikes in data, which can be detected by the internet electronic anti-doping police who will then get very angry. This one is inspired by a genuine incident. A rider had just bought a super-expensive, super-light, pro-spec bike, complete with Shimano Dura-Ace Di2. They live at the top of a steep and unavoidable hill, so in order to post a ride of 20mph average to show off their new machine and no doubt justify its expense, they put themselves and the bike in a car, drove less than a mile down the hill, parked up and then rode around a flatter bit to ensure an attractive average. Then they put the bike back in the car, and drove up the hill home again. And we’re not just telling you this because we’re jealous of their lovely new bike. This sounds a bit extreme, but again this one originates from a reported incident. 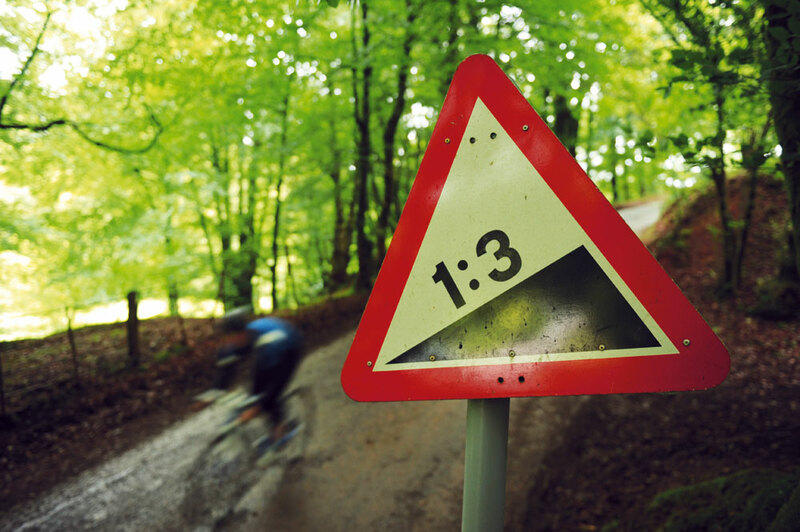 One rider was trying to set a fast time up a steep local KOM segment but had all but ground to a halt within sight of the top. A swift stop, followed by quickly removing their Garmin and throwing it up to the top of the hill as hard as they could ensured a speedy finish to their effort. Their deceit was such that they threw the Garmin into a pre-determined grassy verge to prevent it getting smashed. To be fair, it was a good throw. We won’t let on whether they got the KOM or not, because we can’t endorse this sort of reckless, Garmin-abusing behaviour. Receiving a dreaded ‘Uh oh’ email from Strava means that you have lost one of your KOM/QOMs. You know that you pushed it to the absolute limit to get that KOM, and so the news that someone beat your time by three minutes is as welcome as a double puncture on a wet day. A click on the link to their ride reveals a succession of KOMs and an average speed of 32mph after a visit to a car park. They will claim that they ‘forgot’ to turn their Garmin off after putting their bike in the car, but that didn’t stop them from displaying it unaltered. Others take this further by purposefully setting out in a motorised vehicle and bumbling along at what appears to be riding pace, but a couple of miles an hour above what they are capable of. We’ve heard that mopeds are particularly good at this and receive less attention from agitated drivers stuck behind them. Video: How much faster is an aero bike?